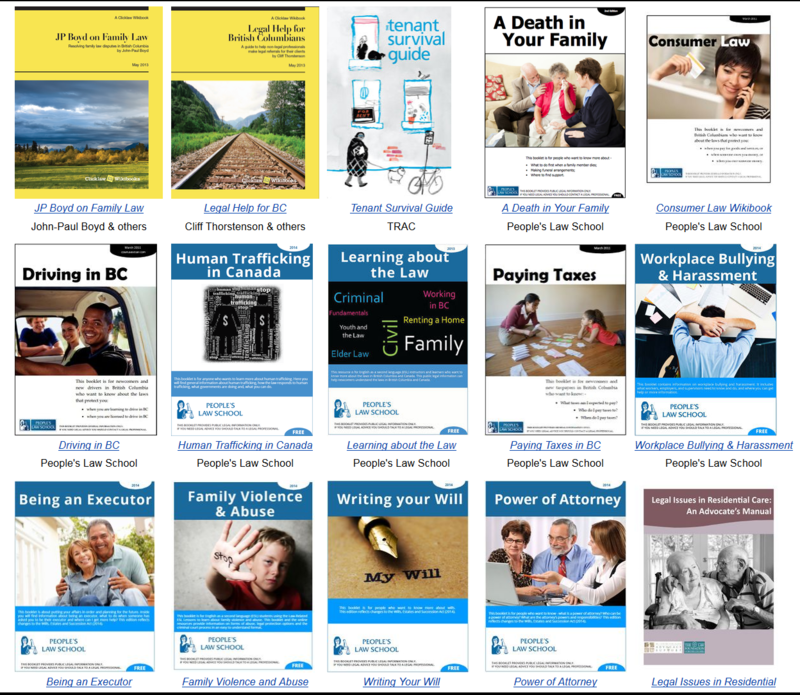 BC has a new legal information resource – a Dial-A-Law ‘wikibook.’ What does this mean? 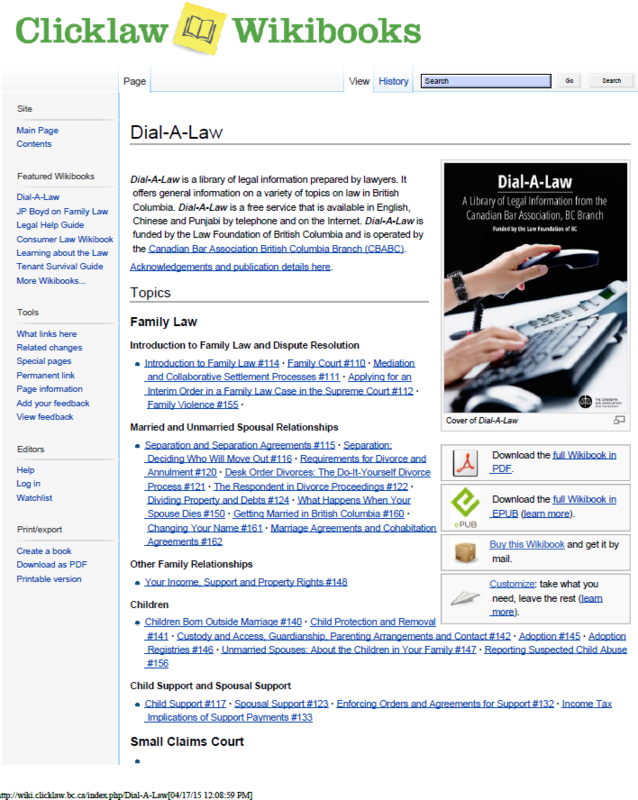 Dial-A-Law is a free legal information service. You used to be able to call them up, and the person on the line would listen to your issue and then play the relevant tape providing you with legal information on that topic. The Dial-A-Law program had its funding cut, and there are no longer staff answering a phone line. There is still an automated phone service available, but you will have to work through an ‘automated attendant’ to find the topic and script your are looking for. Lawyers with the Canadian Bar Association are keeping the information up to date and available to the public on the phone, but also online. There are more than 130 topics! Funding is provided by the Law Foundation of BC. The scripts for these topics are reviewed and updated as necessary, and the tapes are now available online, as well as over the phone, as MP3 files you can listen to. The scripts are also available to be read online or printed off from your computer. The scripts and MP3 files are available in English, Simplified Chinese and Punjabi. 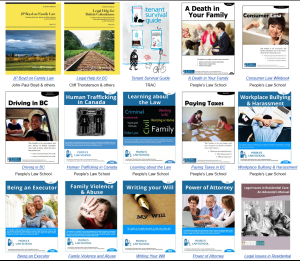 Some scripts of particular relevance to older adults are: 150 What Happens When Your Spouse Dies – Audio 176 Making a Will and Estate Planning – Audio 177 What Happens When You Die Without a Will? 178 Your Duties As Executor – Audio 179 The Disappointed Beneficiary 180 Power of Attorney and Representation Agreements – Audio 217 Applying for a Peace Bond and Filing Assault Charges – Audio 270 Protection Against Job Discrimination 245 Your Bank Account – Audio 248 Co-Signing or Guaranteeing a Loan – Audio 255 Door-to-Door Sales, Time-Shares and Contracts You Can Cancel – Audio 256 Shopping by Phone, Mail or the Internet – Audio 257 Buying Defective Goods – Audio 258 Receiving Unsatisfactory Services – Audio 260 Dishonest Business Practices and Schemes – Audio 235 Freedom of Information & Protection of Privacy – Audio 236 Human Rights & Discrimination Protection – Audio 239 Senior Law and Elder Abuse – Audio 420 Medical Malpractice – Audio 421 Getting Your Medical Records – Audio 423 Making a Complaint Against Your Doctor – Audio 425 Hospitalizing a Mentally Ill Person – Audio 426 Committeeship – Audio 428 Adults and Consent to Medical Care – Audio 435 Choosing a Lawyer – Audio 436 If You Have a Problem With Your Lawyer – Audio 438 Lawyers’ Fees – Audio These scripts have all now been gathered together into a ‘wikibook’ – an electronic online version of a book – with ‘hyperlinks’ to the various sections. With a wikibook you can easily jump to the various topics. It is also easy to keep a ‘wikibook’ updated online. Individual topics in the wikibook can be read and printed out. The full wikibook can also be downloaded in pdf format, or in ‘EPUB’ format. Here is a screenshot of the wikibook main page: At this time the wikibook is only available in English. 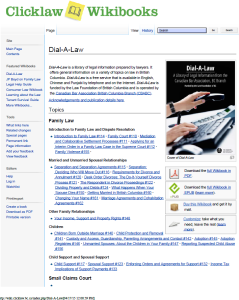 For Dial-A-Law scripts and recordings in Chinese or Punjabi, you still go to the CBA’s Dial-A-Law webpage here: http://www.cbabc.org/For-the-Public/Dial-A-Law. The automated phone service is available in English and Chinese. You can call Dial-A-Law to go through the automated attendant and listen to a script by calling 604-687-4680 in the lower mainland, and 1-800-565-5297 elsewhere in BC.